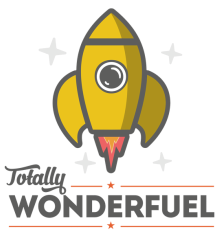 Totally Wonderfuel has a simply food philosophy: honest, healthy, wholesome, nutritious and delicious food to help you eat well and perform better. Fuel for the body and soul; energy without compromise. All our products are bursting with nature's own superfoods such as fruits, seeds, nuts and oats, and natural wonderfuel like dietary nitrates in beetroot and caffeine in coffee. Packed with protein, crammed with carbohydrates, full of healthy fats, high in fibre and teeming with essential vitamins and minerals. Oh, and all home-made, crafted with love, in my kitchen. We won't wage war on lactose or gluten, and can't claim to be wheat-free, fat-free, sugar-free, raw, Paleo or 100% vegan, at least not all the time. But we can promise not to add anything superficial, artificial or nasty, and we can promise that every ingredient is there for a reason, a good reason. Think Mary Berry meets Deliciously Ella....with a bit of Jamie Oliver thrown in (he does like to throw things). It goes without saying that we are sensitive to the needs of people with special dietary requirements and many of our products are naturally gluten-free, nut-free and low FODMAP (Google it!). If in doubt, just ask! The (squidgy) centre of Totally Wonderfuel's distinctive menu is a range of energy balls/ bites/ nutrient-dense spherical wonders. We call them #TWamazeballs, but whatever you choose to call them, there's a ball for everyone (not just Cinderella). ​Everyday Wonderfuel: Delicious and nutritious, all-natural energy bites for anyone, anytime, anywhere. ​Totally Wonderfuel: Our premium range of pocket-friendly #TWamazeballs designed with performance in mind (and body), though sadly we can't guarantee they'll make you go faster! ​We're constantly experimenting with new and exciting flavour combinations and limited editions so look out for the 'New balls please' alerts and don't be shy about making suggestions! All Day Breakfasts: a range of delicious oat-based products (grrreat granolas outstanding overnight oats) designed to be a) drenched with your favourite milk and/ or a dollop of Greek Yogurt, b) used to pimp your porridge/ smoothies/ anything else you fancy, or c) eaten straight out of the bag by the handful​. Please note that many of our products contain oats which are naturally gluten-free but may have been contaminated with gluten during the manufacturing process. Currently we do not use certified gluten free oats but as we make our balls to order in small batches we will do our best to accommodate any special requests. ALL our products may contain traces of nuts, peanuts and sesame seeds. We use only the best, natural ingredients and this means sometimes a stray piece of shell or fruit stone may sneak past our checks and into your balls. Mother Nature sends her sincere apologies, just in case. The protein range of #TWamazeballs contains Bulk Powder's Pure Whey Isolate™ 97, an exceptionally high quality whey protein with 97g protein per 100g. Pure Whey Isolate™ 97 is made from fresh, sweet dairy whey that is isolated and then spray dried. Pure Whey Isolate™ 97 contains 0g of carbohydrates and less than 0.1g of fat per serving. It's lactose free, contains over 29g protein per 30g serving and is comprised of over 12% leucine and 50% essential amino acids. Please click here to read our full Terms and Conditions of Sale. If we fail to live up to your expectations, please tell us! We can't promise eternal happiness or peace on earth and you may think beetroot and yeast extract are the food of the devil. But if you think we've been pants or you don't like one of our products, let us know and we'll do our best to put things right.